2017 In a Sentence: The Spiders averaged 31 points a game on offense and were the only team in the regular season to stay within one score of CAA Champion James Madison, but Richmond’s defense had a hard time getting off the field in 2017, sputtering to a 6-5 record in the tough CAA. Biggest Shoes to Fill: QB Kyle Lauletta. Lauletta was the CAA offensive player of the year in 2017 and was drafted in the third round by the New York Giants. Lauletta draws a lot of comparison to another CAA quarterback in the NFL, Joe Flacco. How Richmond replaces him will dictate how successful the Spiders can be in 2018. Key Player: QB Kevin Johnson redshirted in 2017, but filled in for Lauletta following an injury late in the 2016 season. Johnson acquitted himself well, appearing in 5 games throwing for 762 yards with 3 TDs and only 1 INT. Johnson will need to take a huge step forward to take the Spiders where they want to go – the FCS playoffs. 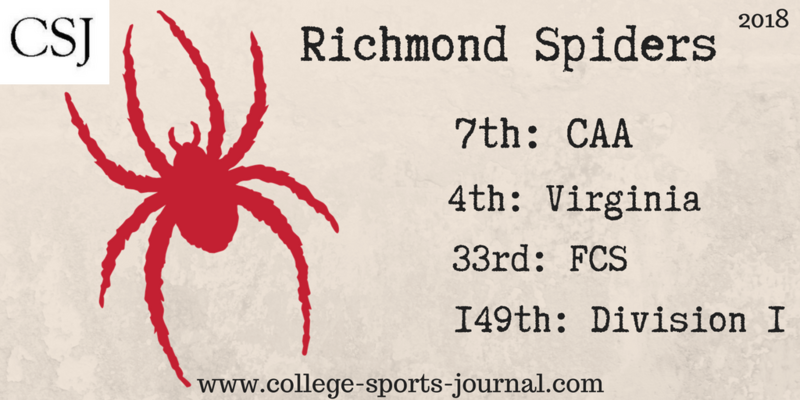 Fearless Prediction: Richmond could certainly contend for a playoff spot for most of the season, but it seems like the defense will again be unable to keep pace with the offense, dooming the Spiders to another middle-of-the-pack finish.